Trotz langer Fahrt ein wunderschöner Aufenthalt im schneebedeckten Yosemite Nationalpark. Tolle Berge und Wasserfälle bei sonnigem Wetter. I take this trip on December 18. This tour provides excellent service, especially Ned, he is awesome guided tour. He is knowledgeable and makes a nice trip to Yosemite. I feel very enjoy when he tell the story about this park. We have a small group and take a small van that are very convenient and easy to get in and get off. Ned stopes the van at the incredible view for us for taking a photo. 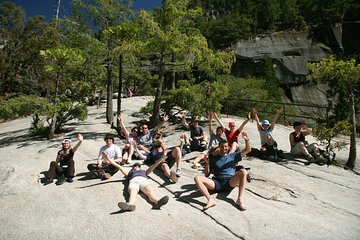 He give a time for us for 3 hours for exploring Yosemite Park. I think it is enough time to walk along the trail. I get many beautiful pictures, especially taking the pictures at Mirror lake. Trip stop by a local grocery, it has a lot of food to buy. Personally, I think it's worth every penny. Thanks very much Ned!! On booking we were concerned about the length of this tour, but it had been scheduled through the day with plenty of rest stops. Our tour guide Lily was very knowledgeable and approachable. Highly recommended. Unfortunately the nearby forest fires meant views in the park weren't great, but it was still amazing scenery and worth exploring, despite the long drive. En-route you stop off midway after about two-hours at Oakdale, where there is a supermarket with cafe and deli counter and you are advised to get sandwiches here for lunch to maximise time in the park. You also stop here on the way back. Our guide pointed out sites along the journey and told us about wildlife and geology of the park. The journey there is long with some steep windy, roads, but the mini-bus is comfortable and air conditioned. The park is huge and in a few hours you only have chance to walk around Yosemite Valley but there are some great views from the bus en-route. You have about 3 hours in the Valley as free time to explore. This gave us chance to take the free shuttle bus between sites there are 20 stops in a loop and the bus comes round every 10mins and it takes 50mins to do the entire loop as well as walks to lower yosemite falls, the swinging bridge and the visitor centre. There is no time for longer hikes. Your guide gives you a couple of maps I didn't find signage in the park that easy to follow, but the shuttle bus was good if quite crowded. You can hire bikes in the area. We then drove on to the base of El Capitan with our guide for photo stop and then onto Bridalveil Falls for photos, which were amazing despite the smoke from the fires. Temperatures were warmer in the park then at the coast so I would advise wearing layers. The park facilities were run down, filthy, and not very helpful employees. I’ve been to most of the national parks and monuments in this great country...this one was beautiful but severely neglected. sorry but it was not like tour. It was like a transportation to go there. We passed many view points which other travel agency were stopped. Der Yosemite NP ist fantastisch! Wir hatten ein wunderschönen Tag dort! Auf jeden Fall einen Besuch wert. Ich würde bei einem erneuten Besuch eher dazu tendieren mehr als einen Tag zu bleiben. Die Fahrt ist sehr lange 4,5 Stunden und im Vergleich dazu hat man recht wenig Zeit im Nationalpark 3 Stunde freie Zeit. It's a 4.5 hour drive there and back but it is well worth it. The guide talks during the drive so you learn a lot and the time flies by. We had 3.5 hours there, which was enough time to do some trekking. The waterfall is still decent very tall even in winter with the snow around.